David Morgan was appointed Principal Tuba of the Tucson Symphony Orchestra in 2010. He hails from Vienna, Virginia, a suburb of Washington, DC. David studied tuba with Michael Bunn (Kennedy Center Opera House Orchestra) at the Shenandoah Conservatory; he earned a bachelor of music in tuba performance in 2003 and minored in bass trombone. He later began graduate work at Carnegie Mellon University where he studied tuba with Sumner Erickson of the Pittsburgh Symphony. David has performed at the Aspen, Hot Springs, and Bay View Music Festivals as well as having freelanced throughout the DC area. He recently married Betsy Bright Morgan, TSO second trumpet. I have this seasons repertoire in addition to various playlists for upcoming auditions and/or recitals. I also listen to This American Life podcasts. Listening to my grandfather play the organ at church services. My fifth grade band teacher had basically chose the tuba for me, telling my mom that I had a good sound. 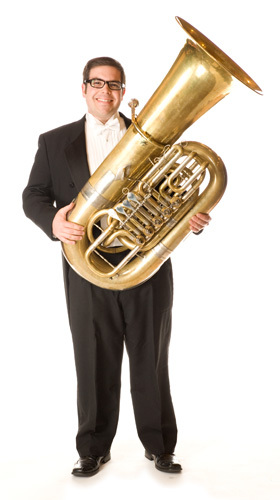 I liked the tuba because of its low sound and large demeanor, such as myself. So far my favorite music to perform is Prokofiev’s Symphony No. 5. A close second is Igor Stravinsky’s The Rite of Spring. I enjoy hanging with family and friends as well as outdoor activities such as hiking. Shenandoah Conservatory in Winchester, VA as well as Carnegie Mellon University in Pittsbrugh, PA. The Desert Museum, 1702, Sabino Canyon.